Tuesday May 26th 1925 Still in bed suffering greatly. Hattie came over late in the afternoon and we sent for Dr Hazard. Letter from Ida. Wednesday May 27th 1925 Still in bed. The doctor came again. Mrs Swisher who had been to an Elder Daughters party stopped awhile. 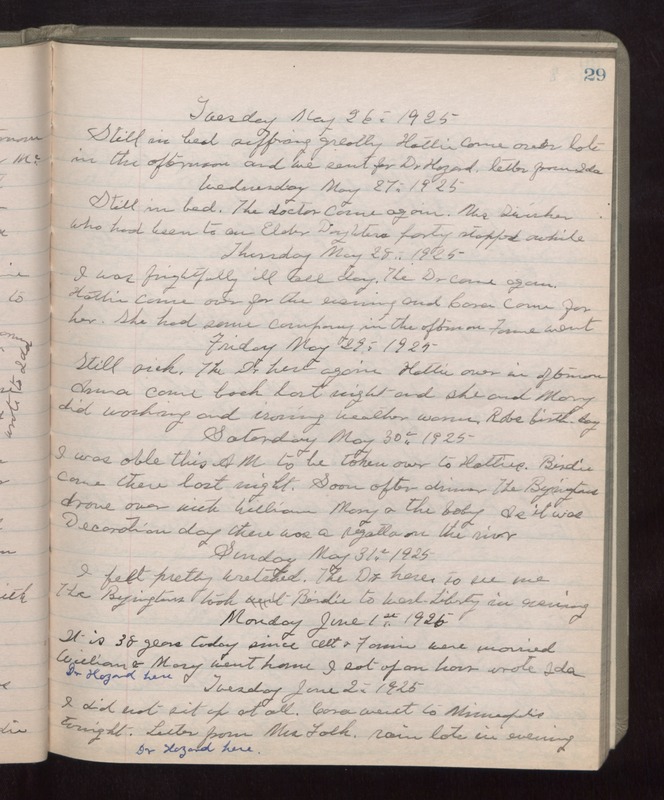 Thursday May 28th 1925 I was frightfully ill all day. The Dr came again. Hattie came over for the evening and Cora came for her. She had some company in the afternoon. Fannie went. Friday May 29th 1925 Still sick. The Dr here again. Hattie over in afternoon. Anna came back last night and she and Mary did washing and ironing. weather warmed. Robs birthday. Saturday May 30th 1925 I was able this AM to be taken over to Hatties. Birdie came there last night. Soon after dinner The Byingtons drove over with William, Mary & the baby. As it was Decoration Day there was a regatta on the river. Sunday May 31st 1925 I felt pretty wretched. The Dr here to see me. The Byingtons took Birdie to West Liberty in evening. Monday June 1st 1925 It is 38 years today since Ott & Fannie were married. William & Mary went home. I sat up an hour. Wrote Ida. Dr Hazard here. Tuesday June 2nd 1925 I did not sit up at all. Cora went to Minneapolis tonight. Letter from Mrs Falk. Rain late in evening. Dr. Hazard here.